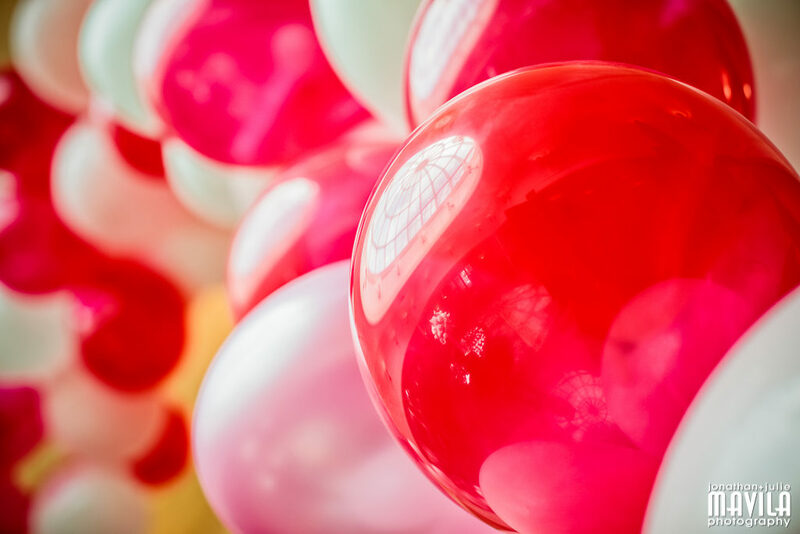 It’s always helpful when the Mitzvah Guest of Honor (GOH) is excited about their day and all it entails. 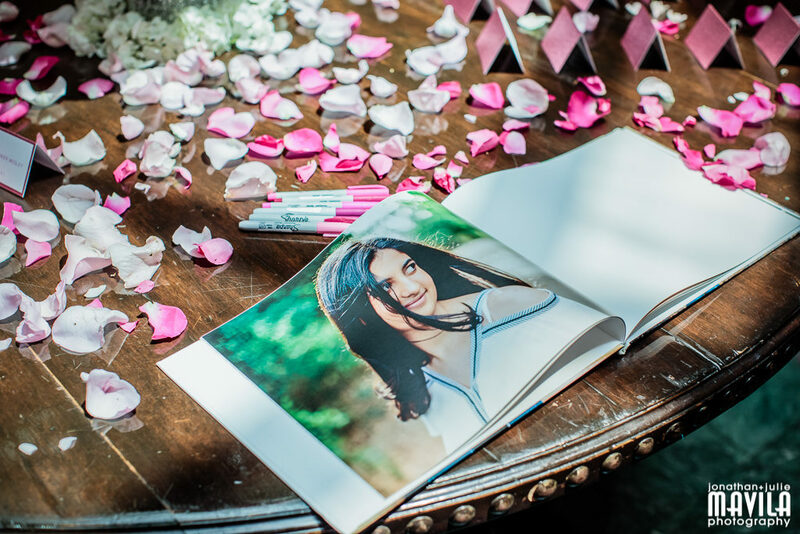 This teen certainly was more excited than most since she wanted to be a part of the entire planning process. 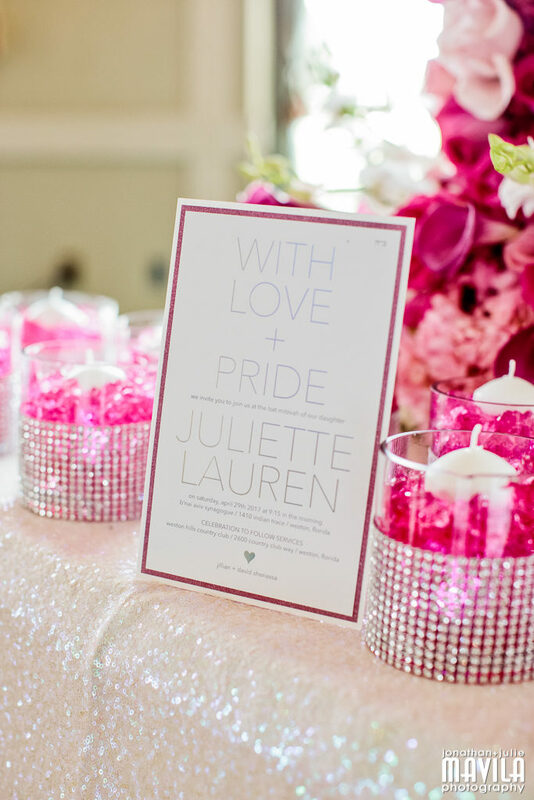 Juliette loves the color pink, which was a perfect start to determining the décor. 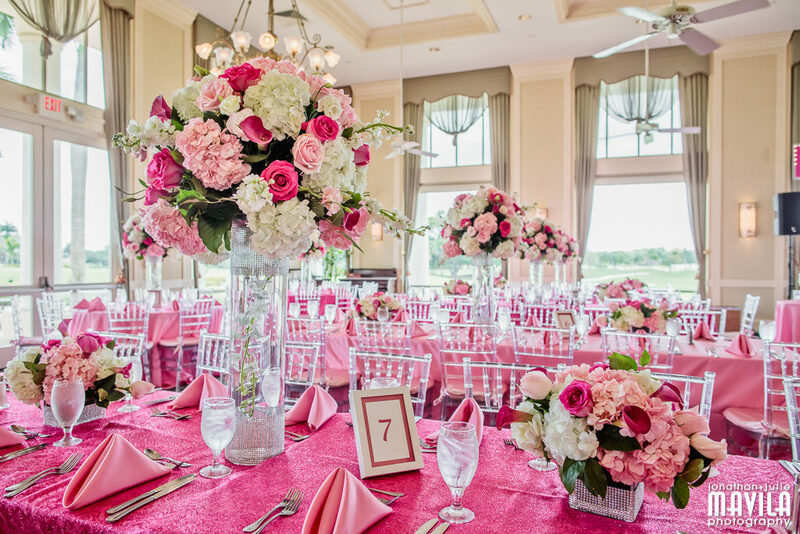 We wanted this party to be filled with all things pink. 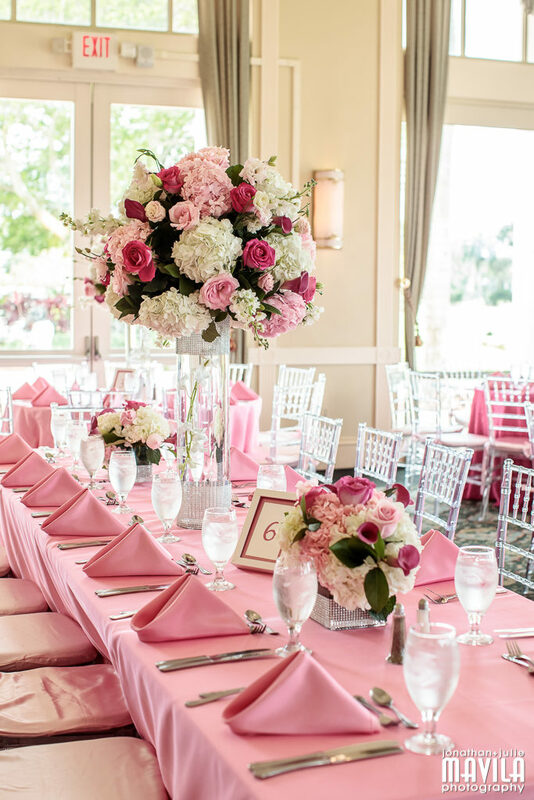 Dalsimer Atlas Floral and Event Decorators created centerpieces with roses, hydrangeas, and calla lilies in shades of fuchsia to baby pinks with touches of white to really pop the preferred hue. 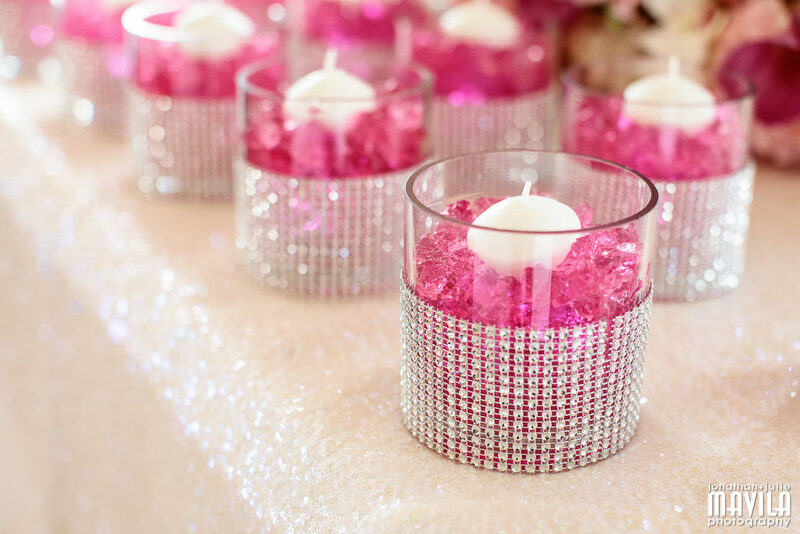 These sat upon alternating shades of pink bengaline linens. 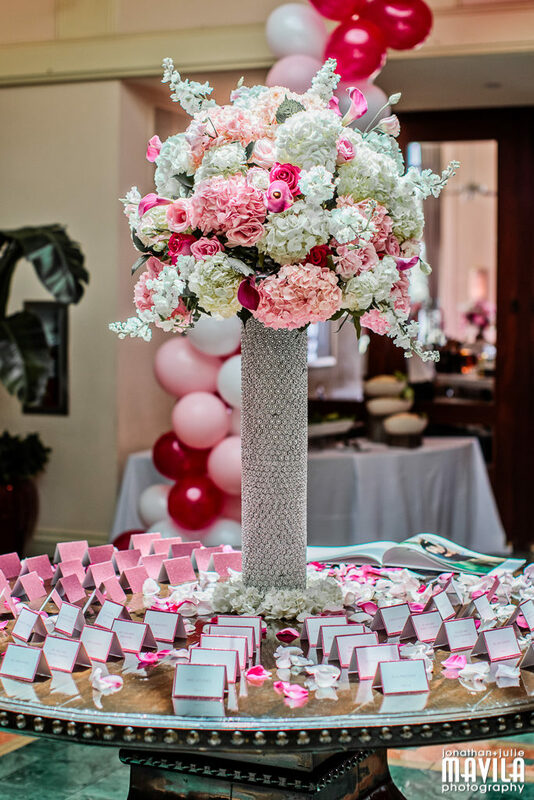 Our GOH also wanted a bit of bling which was incorporated on the vases to the bar, and even the cake. 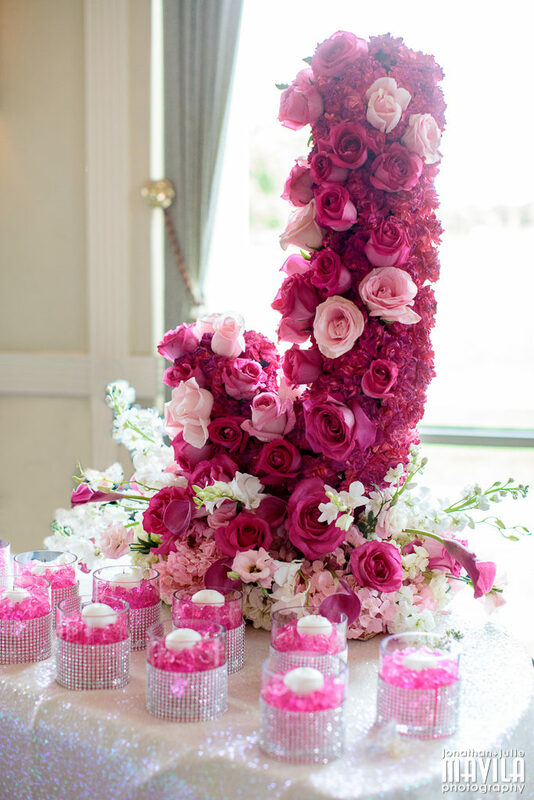 We just loved the candle lighting piece which was created using roses and callas to form a floral “J” alongside the candles nestled in hot pink gel cubes. 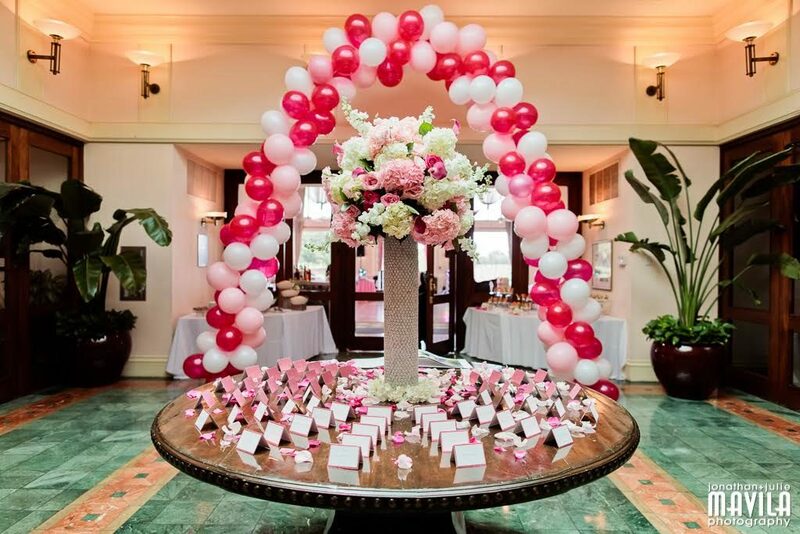 Guests walked under a balloon arch made in a pink ombre form as they entered the Weston Hills Country Club dining room, where they were greeted by Pure Energy Entertainment. 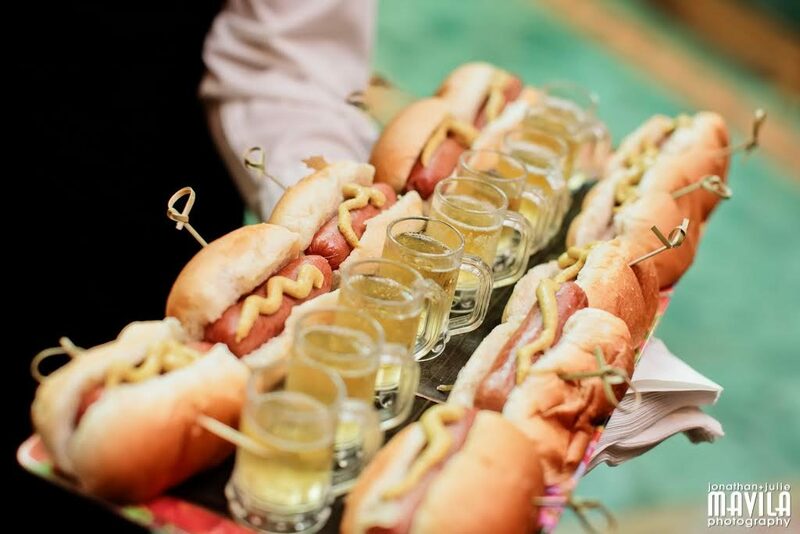 Weston Hills Country Club passed mini appetizer pairings such as hot dogs and beer, and tequila and tacos which guests just loved among other tiny delights. 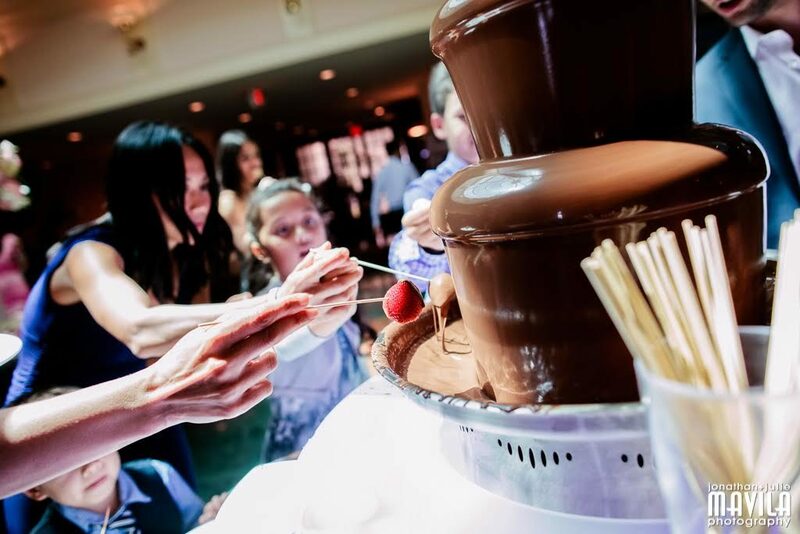 They then presented an amazing brunch buffet. 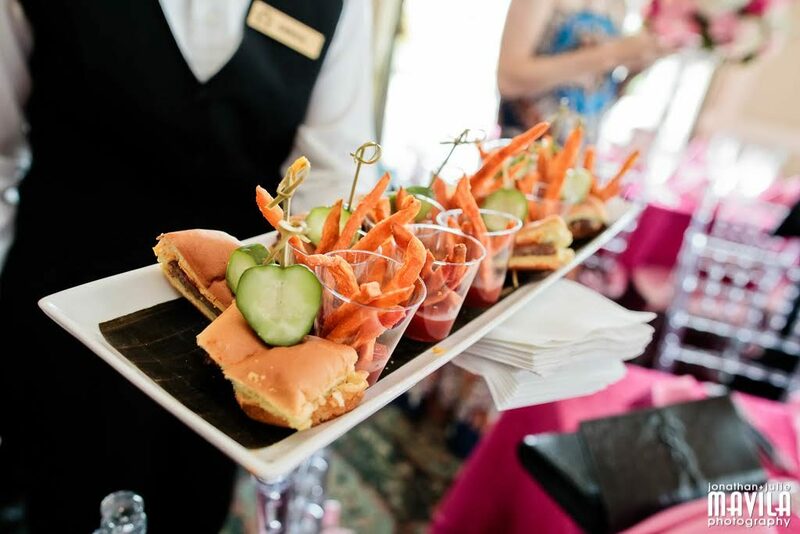 From an omelet station to a carving station, and all else in between, there was something for everyone. 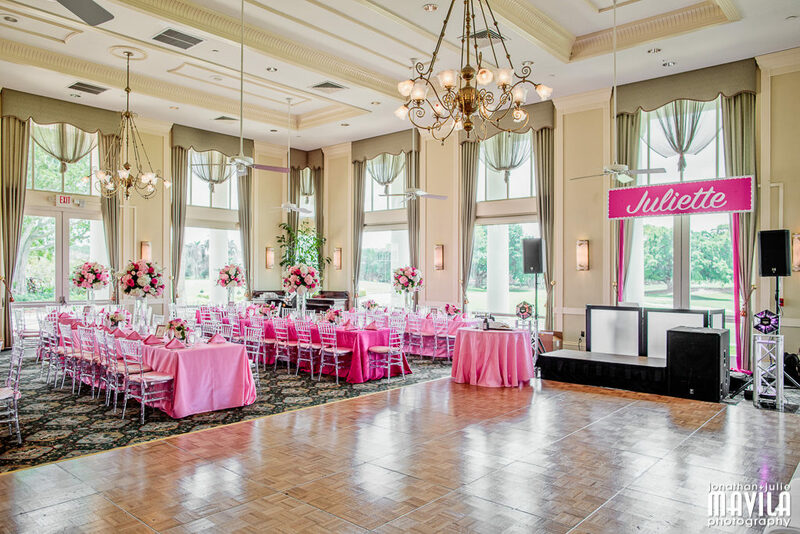 No one suspected that this afternoon affair would be going strong on the dance floor, but this crowd must have been tickled pink since they were non-stop dancing. Of course, MC Matt took advantage of their excitement and took them through a series of dance sets until the very last minute when they were begging for more. 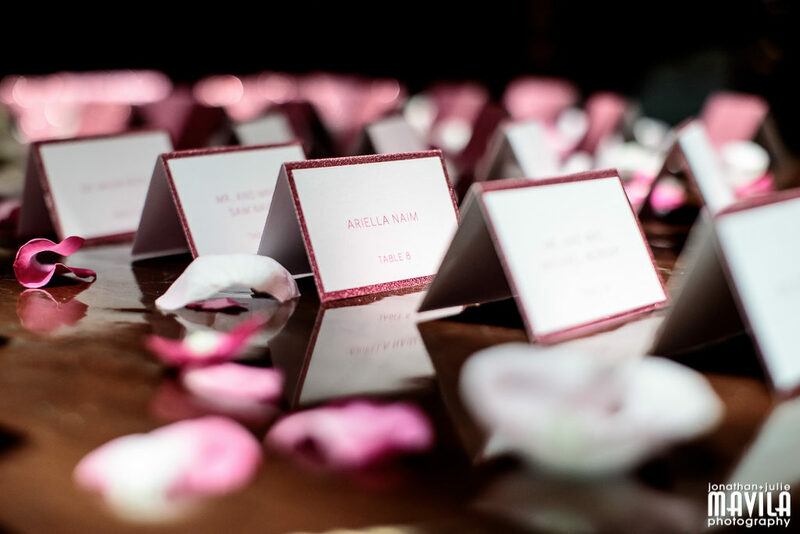 Mavila Photography and Partigliani Photography + Cinema were right in the center of it all as they captured the laughter, the smiles and plenty of rosy cheeks. 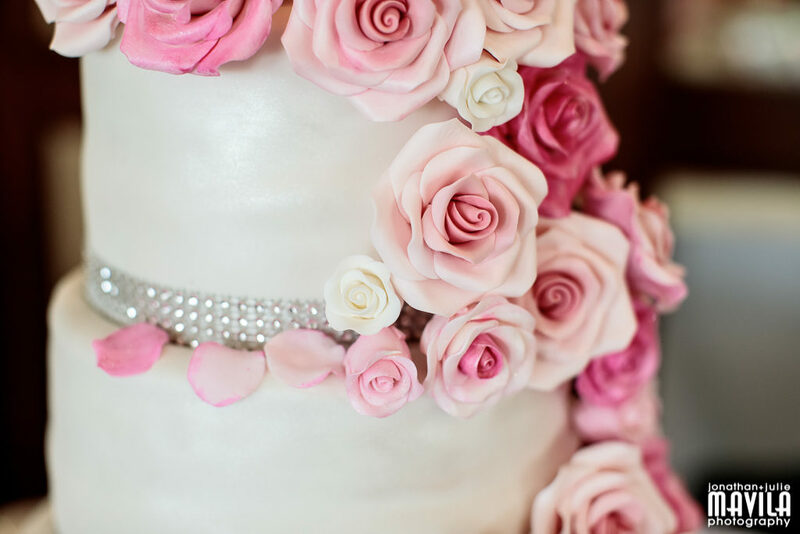 But wait, there’s always time for cake! 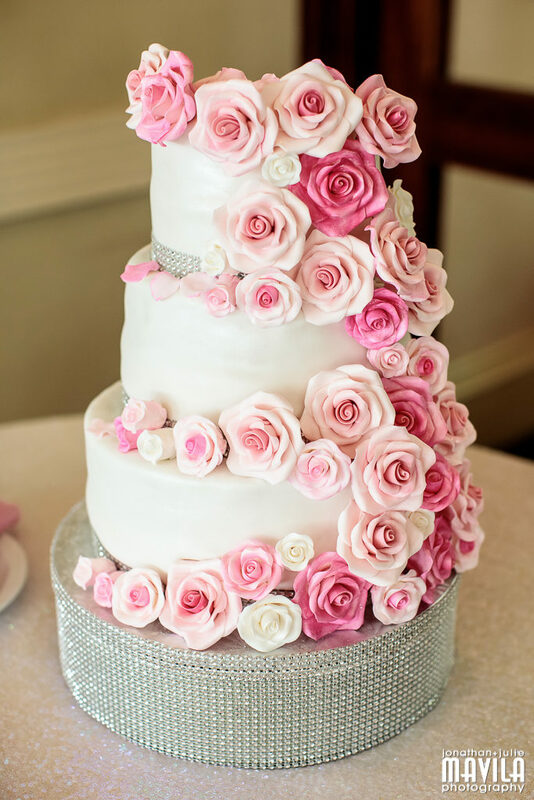 Especially this one that was created just for Juliette by Cake It ‘til Ya Make It. 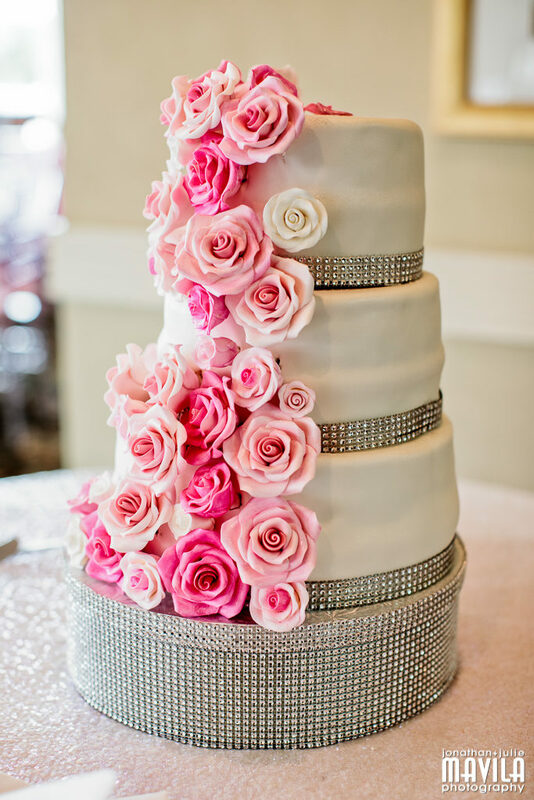 This triple-tiered masterpiece was decorated with fondant and cascading roses, and wrapped with bling. Not only did it look fabulous, but tasted incredibly delicious as well. 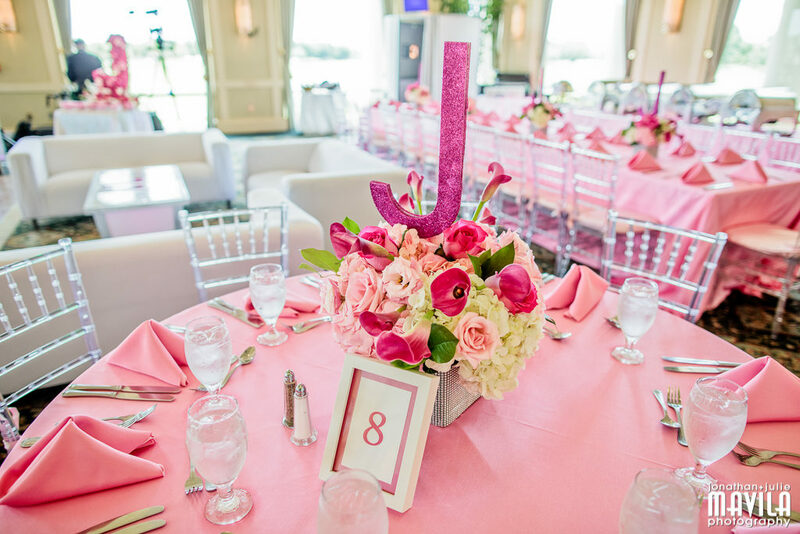 Utilizing a favorite color always makes a STYLED event. 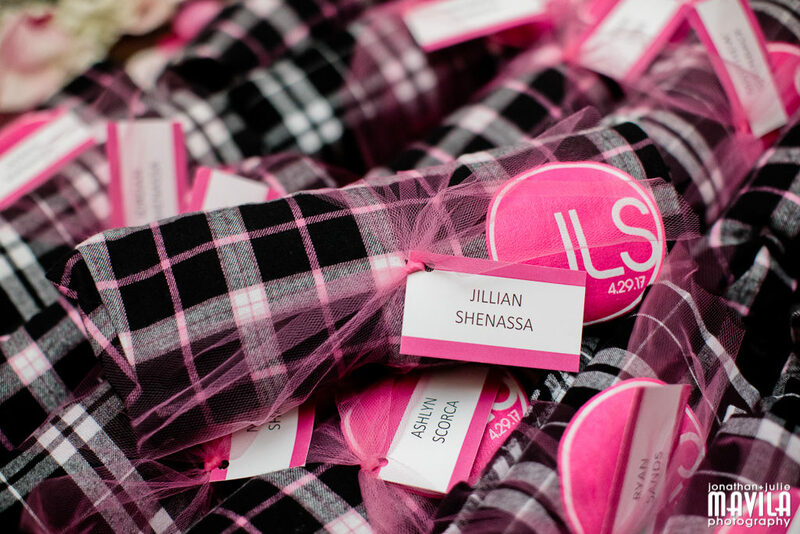 Mazel Tov to Juliette and her family!